Working when they feel like it, sleeping the day away, partying all night, and making sure you know that whatever you say or do means not a whit to them (what IS a whit, anyway? ), these creatures who inhabit a homestead do not hop, trot, gallop, waddle or run like the other resident critters—they saunter. Saunter around the corner just in time for dinner. Saunter away with a mouse after a lightning quick hunt ends successfully. Saunter purposefully after doing something embarrassing, exuding “I meant to do that” from every furry pore. Saunter right in front of your legs while you are carting in 50-pound bags of feed, or better yet, groceries. The sack with the breakables in it. The fuzzy equivalent to the relation who comes to visit, and then stays long past his welcome, not with appreciation, but with the attitude that he’s doing you a big fat hairy favor by consuming YOUR food and using YOUR utilities, you know, of course, who I’m talking about. Why on Earth would we keep a creature around that seems to be in permanent teenaged morosity? “To catch the mice,” we claim defiantly. I currently have three cats in residence. Gremlin was born here 12 years ago. His mom was a tiny feral fluff of a kitty who had 2 kittens under the house. Shortly after the kitties were weaned, momma cat disappeared with the cute kitten, and Gremlin was left. Mostly wild, he’s prime Farm Cat material, yet if confronted, nay, presented with a mouse, he turns his back and yawns. I’ve witnessed him hastily pulling his paw away from danger of coming in contact with a running mouse. Oswald was born in the lap of luxury—the planned child of two housecats. Fluffy, orange and white, with whiskers all the way out to there, Oswald lived in our house till we started the big, noisy, alarming parts of our home renovation, at which point he showed his displeasure by using our bed as a litter box. After a few such episodes, I picked up the cat, opened the front door, and unceremoniously plopped him onto the porch, closing the door behind me. Surprisingly, Oswald is the Master Mouser. He can hear a mouse from across the yard and through an insulated wall. If I come across a mouse in a feed sack, all I have to do is say “here Ozzie” and he’s right there to retrieve it for me. I tip the sack and in he darts, backing out with the offending rodent. If there are TWO mice in the sack, that’s his specialty—it only takes a split second longer, then he backs out with a mouse-tashe, one tail drooping out of each side of his mouth. For the squeamish mouse lovers out there, Ozzie is also the most business-like cat I’ve ever seen. He’s not interested in the least with playing with his hapless prey. It’s a quick execution, followed by happy ingestion. If you do not feed your barn cats, they will be better hunters. 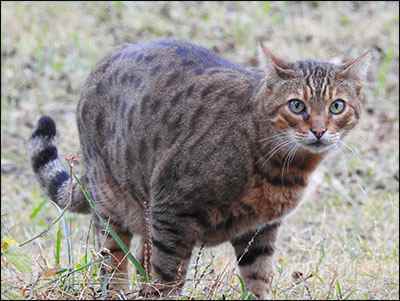 The truth is, if you do not feed your barn cats, they will get very skinny and leave. Or die. Or both. Cats hunt for one reason only: the personal satisfaction and pleasure they receive from causing something smaller than them to be very afraid, and then killing it. Well-fed barn cats will be stronger, happier, and quicker. Barn cats are a renewable resource. There are not many things cuter than a litter of kittens. If you have an unspayed female cat, you will soon know the joy of frolicking kittens. Cats reproduce at an amazing rate of speed. A female cat will be ready to breed any time after about five months of age. At this time they come into season, which is accompanied by caterwauling and a very seductive (to tom-cats) way of locomotion that looks to the casual observer like they’ve been hit by a fast-moving vehicle causing the fracture of several vertebrae. This attractive behavior will continue till they are spayed, or impregnated. Left to their own devices, a female cat will have two litters of kitties per year. The average litter is four kittens. If half of them are female, you will have eight frolicking kittens the first year. Twenty boisterous kittens the second year. One hundred and twenty truly horrifying kittens the third year. And by the fourth year, you will have to move to a new place, because the SIX HUNDRED KITTENS will make your current place a complete wasteland. Make some calls. Your local shelter should be able to direct you to low cost spay/neuter clinics or programs that will sterilize your cats and give them a rabies shot for a nominal fee. Sure, it costs money, but nothing like trying to keep SIX HUNDRED KITTENS in food. Barn cats do not need to be vaccinated. In fact, it is required by law that they are up to date on rabies vaccinations, which, depending on your state is either given annually or every three years. Additionally, cats (especially outside cats or large groups of cats) are very susceptible to some other unpleasant and potentially fatal diseases. Feline Distemper is very contagious, and even though it’s rarely fatal (unlike Canine Distemper), it’s still a drag to be surrounded by a bunch of cats with snotty noses and runny eyes. You can vaccinate against this, Calicivirus and herpesvirus, in a combo vaccine known as the FRP. These are considered “core” vaccines, and are essential for all cats. A 4-way vaccine, adding Chlamydia is also available, and for the extra few cents, a really good idea, even though the chance of a human catching Chlamydia from a cat is extremely unlikely. Feline Leukemia is a good vaccination to consider—if contracted, a cat can either be a carrier who can pass it on to other cats, or break with it themselves—and it’s always fatal. Lastly, and dependant on the tameness of your cats and the intestinal fortitude of yourself and your helpers (never attempt doctoring a cat by yourself), cats should be periodically wormed, and treated for fleas and/or ear mites. Make sure any treatments you are giving only need to be given once a month, maximum. Cats remember. And act/react accordingly. Nothing clears a porch of napping cats like the appearance of a human with the flea spray or ear mite drops in hand. If you ever need to give a pill to a cat, see the handy directions at the end of this article. These directions have traveled the world over, and I tried to find the original author, but had no luck. My best guess is that he/she has been quietly committed. So, why DO we keep cats around, when we could accomplish mouse control via a visit to our pest control aisle at the Farm and Fleet? Well….in addition to catching mice, there is a theory that cats keep the population of snakes in the house/barn in check. Not that they hunt snakes. They don’t. But since cats are by nature into, under, on top of, and behind EVERYTHING, it makes for precious few peaceful hidey-holes for snakes to, well, hole up in. And snakes love peace, so are less apt to hang around where there is cat activity. I have a friend who runs a boarding kennel who swears that fleas prefer cats over dogs, and when she gets fleas on the dogs in the kennel, she tosses her unflappable house cat in there for a day. She claims that the dogs are then flea-free and the only critter she has to treat is the cat. Dubious, but makes for some interesting mental images. Oh, there are the Norman Rockwellian reasons for keeping cats—think of every image of a successful, peaceful happy farm—a cat dozing in the hay loft, a cat gazing contentedly into the fireplace, cats following the milkmaid to the barn, cats draped over front porch furniture like furry doilies. I suspect that the real reason many of us keep farm cats is exactly because we aren’t KEEPING them. Everyone else on the farm is being held there by physical barriers through the use of fencing or coops (goats, dogs, chickens, horses) or by mental barriers through the use of legal contracts or age deficiencies (spouses and children). In spite of their aloof attitude, so different from dogs (dogs look at you like you hung the moon, cats look at you like you just flashed them a moon) cats stay for one reason. 6) Kneel on floor with cat wedged firmly between knees, hold front and rear paws. Ignore low growls emitted by cat. Get friend to hold head firmly with one hand while forcing wooden ruler into mouth. Drop pill down, remove ruler and rub cat’s throat vigorously. 7) Retrieve cat from curtain rail, get another pill from foil wrap. Make note to buy new ruler and repair curtains. Carefully sweep shattered Doulton figures from hearth and set to one side for gluing later. 8) Wrap cat in large towel and get friend to lie on cat with head just visible from below armpit. Put pill in end of drinking straw, force cat’s mouth open with pencil and blow down drinking straw. 9) Check label to make sure pill is not harmful to humans, drink glass of water to take taste away. Apply band-aid to friend’s forearm and remove blood from carpet with cold water and soap. 10) Retrieve cat from neighbor’s shed. Get another pill. Place cat in cupboard and close door onto neck to leave head showing. Force mouth open with dessert spoon. Flick pill down throat with elastic band. 11) Fetch screwdriver from garage and put cupboard door back on hinges. Apply cold compress to cheek and check records for date of last tetanus shot. Throw T-shirt away and fetch new one from bedroom. 12) Ring fire brigade to retrieve cat from tree across the road. Apologize to neighbor who crashed into fence while swerving to avoid cat. Take last pill from foil-wrap. 13) Tie cat’s front paws to rear paws with garden twine and bind tightly to leg of dining table, find heavy duty pruning gloves from shed, hold cat’s mouth open with small spanner. Push pill into mouth followed by large piece of fillet of steak. Hold head vertically and pour pint of water down throat to wash pill down. 15) Arrange for SPCA to collect cat. Ring local pet shop to see if they have any hamsters. 1) Stuff pill into a piece of cheese.